Foodwaste Friday and why buy this? Waste wasn’t awful this week but it wasn’t perfect either. I let 3 english muffins grow a blue coat for winter and somehow 2 pears went from rockhard to mushville in the space of 24 hours. I”m going to take a second here to also thank (once again) Kristen at Frugalgirl for starting this great idea. I know without this post on Friday’s in the back of my mind I would NOT be doing nearly as well. 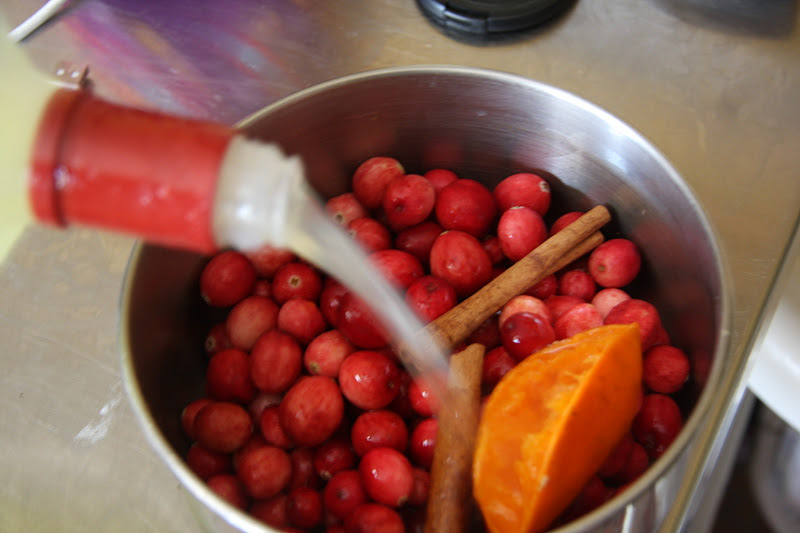 I thought though it would be fun to add this mini recipe for something we all are going to have a lot of in the next couple of months; Cranberry sauce. If you are still resorting to the gelatinous can of red goop then settle no longer. 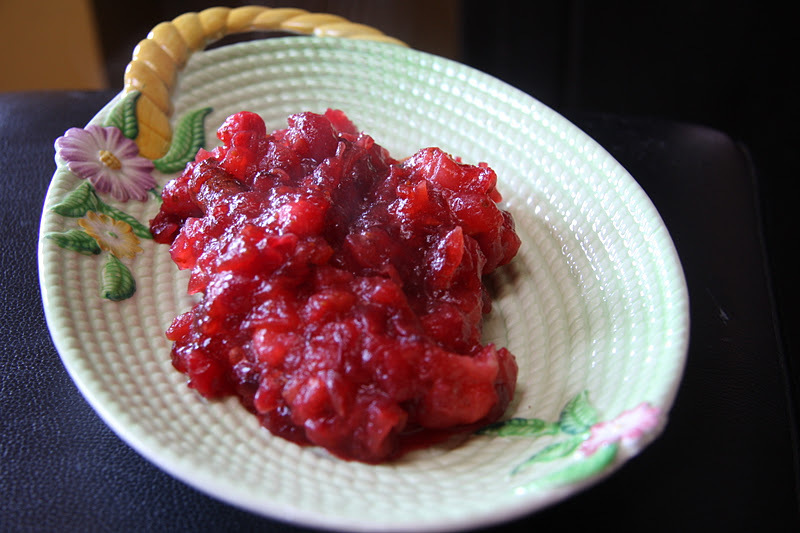 Cranberry sauce won’t add to your already huge cooking workload for the holidays. It can be made several days in advance and only takes a couple of minutes. Take a bag (usually 2 cups) of fresh cranberries (you could use whole frozen ones too), 1 stick of cinnamon, 2 T. of honey and 3 T. of limoncello (you could use orange liquor OR red wine or port OR orange juice instead). Cut an orange in half and squeeze it to release the juice. Add the squeezed halves to the pot. 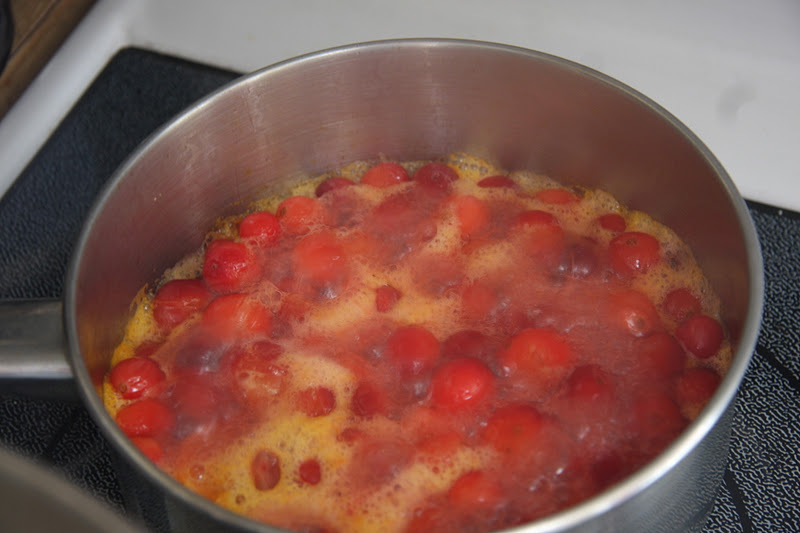 Let bubble until the cranberries are soft and most of the liquid has evaporated (about 4 minutes). Take out the orange halves and the cinnamon stick and place in a pretty dish. DONE! People will actually eat this-no lie. And there's nothing like a brie and cranberry grilled cheese sandwich…MmmmmmmmHappy Friday, by the way. So true. So true. Say hey to Bean for me. Your cranberry sauce looks so good! My family has never been into having cranberry sauce for the holidays, but my grandma does buy the can stuff. This looks soo much better. I want to try it. Question: How high do you heat the stove during the approximate 4 minute time period? The cooking time for this is a lot less than I would have thought! High heat and then just turn the burner off after a nice four minute boil. This looks great! Thank you for sharing your recipe – if dinner ends up being at my house, you can bet this will be on the table.